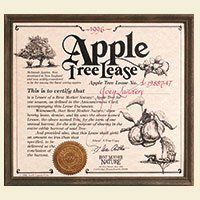 Rent an apple tree to give someone macs from their own tree. The apples were crisp & fresh. I made 2 apple pies & applesauce. A real treat. Outstanding apples! Delicious and not a blemish on a single apple -just beautiful and so tasty!! We love the idea of farm leases. The apples were the best I’ve had in years.